An overcast, typically drizzly dray in Scotland. I walk out of the cold and into the warmth of my home. It smells like butter, warm hugs, autumn, sugar and spice. Cookies. The winter drags on, though it is interspersed with happy bursts of sunshine. Sometimes I think I live in a magical landscape, like a painting in Harry Potter: always the same hills are represented but their colours change constantly from purple to luscious green speckled with gold, and the clouds like balls of cotton seem to dance upon them from dawn till dusk. The other day I sat on my porch, while Mali gingerly tested the dewy grass, and I marvelled at it all. What a life. What a splendid, impossible life. These cookies. Warming, wonderful, delightful in their simplicity. Like Scotland. Whatever the weather, whatever disappointments and setbacks the day may have brought along, at the end of the day, they will welcome you home and whisper to your heart: This too shall pass. Am I talking about the cookies now, or about Scotland? Who knows, who cares. Take a bite. Welcome home. Pre-heat the oven to 200º (400ºF). Line a large baking tray with baking parchment. Combine the dry ingredients in a large mixing bowl. In a second, smaller bowl whisk together the wet ingredients, save the extra almond butter for frosting. Fold the wet ingredients into the dry. Get in there with your hands if you have to; it should be quite tough and pliable, not sticky. Take about 1/2 tbsp of the dough and roll it into a little ball. Press it flat onto the baking tray. Repeat this until you have about 20 small flat disks. Bake in the oven for 12-13 minutes. The edges should be slightly darker than the centre and look crisp, but not burnt. Cool on a wire rack. Resist temptation to eat straight away or burn your tongue and repent. 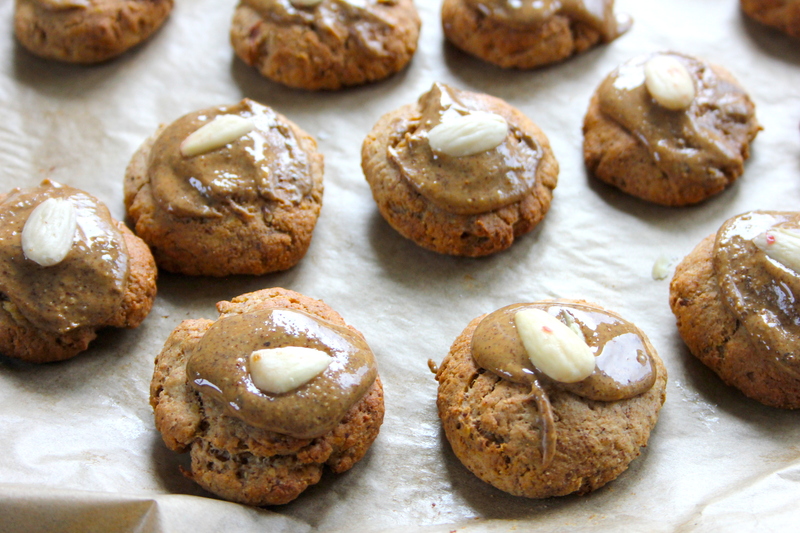 When the cookies are still a little warm drop about 1/2 tsp of runny almond butter on top of each cookie. (Do the math, that’s about 10 tsp, or about 3-4 tbsp.) Press an almond down in the middle. It’s ok to eat them now; they’ll be soft in the middle, crackly around the edges, and it will feel deliciously naughty. What makes you feel like you’re coming home? OMG …. another sin …. It’s soooooo good, isn’t it?! I always eat half the jar as soon as I get home with the shopping, then have to restrain myself for the next few days, haha! I ate probably 5 of these cookies the same day I made them. I took the rest to work to share the calories – er, love, I mean. 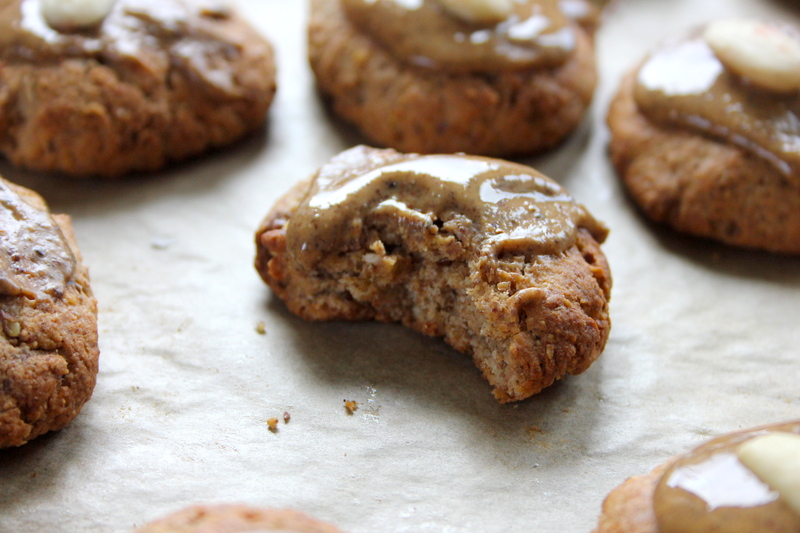 That’s some melty and delish looking almond butter! 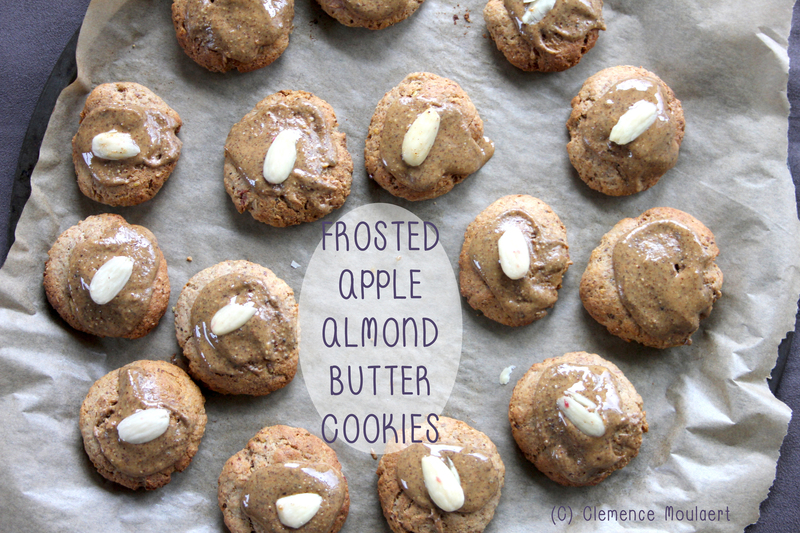 Beautiful cookies, love the almond sliver on the top – I’ve had Chinese almond cookies like these before! Chinese almond cookies sound delicious! These look really pretty, just like I’m sure Scotland does 🙂 I think I’m going to try them, I kind of hate almond butter but maybe these cookies will change my mind? And I know some people who love it, so they’ll eat the whole batch if I decide I still can’t stand it. But almond butter is the best! GIMME ALL THE JARS. Maybe try regular peanut butter? Macadamia nut butter? Pecan butter? Hazelnut butter?